After the analysis had been published, medical services reported at least three protesters were killed; at least two of them were killed from firearms. In a democratic country every fact of violation of law must be duly investigated, a circle of suspects determined and the court proves guilty or not guilty of the violation. In its official statement with regard to the confrontations on Hrushevskogo street the Prosecutor General of Ukraine Mr. Viktor Pshonka declared that “the Law is being severely violated in the State”. It should be up to the law enforcement agencies to establish guilt of some participants of protests, especially considering the fact that they are already on it. Let us analyze how the law enforcement officers violate the law during the protests. The right to peaceful assembly is guaranteed by the article 11 of the European Convention for the Protection of Human Rights and Fundamental Freedoms, article 39 of the Constitution. According to these documents the State must not only to not impede peaceful assemblies but also to protect their participants. Protests – always means a crowd of people, who are mostly different and disorganized. Someone among such people often wants radical and not peaceful action. Therefore, designated state representatives – law enforcement authorities – are obliged to ensure public order and security of people. This means – to detect and neutralize persons violating the law pursuant to provisions of legislation to ensure the security of other participants of the protests. According to the OSCE Guidelines on Freedom of Peaceful Assembly the law enforcement officers shall differentiate protesters whose actions have a peaceful character from the participants who want to apply violence. Therefore they should not be treating the crowd as one mass. On practice, the police should apply such tactics that would allow neutralizing (defusing) only those who are violent and poses a threat without damaging others. Law enforcement officers must just as well differentiate protesters from bystanders, particularly journalists. Such work requires a special organizational preparation from the side of police, particularly the engagement of special units that are able to work in complicated operative conditions. 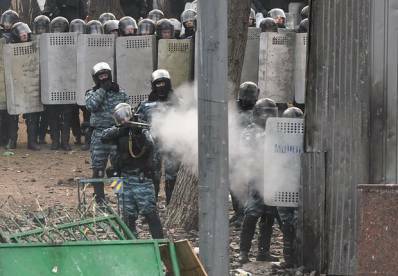 During the events on Hrushevskogo street a special unit “Berkut” was engaged, however it didn’t show the skills necessary – we had a chance to observe how the police instead of localizing the conflict fenced from the protesters and used impact munitions against the crowd with perpetrators, peaceful participants and journalists in it. According to mass media, as of 20 January there are more than 20 journalists who suffered injuries from explosions of flash bang grenades, rubber bullets and gas. The use of impact munitions is also very strictly regulated by the relevant documents. Thus, pursuant to the acting Rules for the use of impact munitions when protecting public order approved by the Decree of the Council of Ministers of Ukrainian SSR of 27 February 1991 №49 (hereinafter – the Rules), flashbang munition of diverting action (flashbang grenade “Zarya”, flashbang device “Plamya”) shall be used on the distance of more than 2 meters from a person. During the clashes on Hrushevskogo street, the law enforcement officers threw flashbang grenades just into the crowd staying behind the frontier and barricades with machinery without thinking who they would hit, which means that there were no measures taken to safeguard the people from heavy injuries. As a result, the participants of the protest together with the journalists received lacerations of the extremities caused by grenades, one person lost his hand. During the events on Hrushevskogo street parts of the cartridges of the devices for instantaneous tear aerosol “Teren – 6” were found. “Teren-6” device was taken on duty by the law enforcement agencies in 1997. The Ministry of Internal Affairs of Ukraine developed an “Instruction for the use of the impact munitions “Teren-6” (the Decree of the Ministry of Internal Affairs of Ukraine of 13 January 1998 №26), however, the text of the Instruction cannot be publicly accessed since it is a “for official use only” document. Therefore it is impossible for an ordinary citizen to get the official text with the provisions for the use of “Teren-6”. However, non-official sources tell us that the use of these devices is regulated by the same provisions that are used for the flashbang grenades – not less than 2 meters from a person. During the events on Hrushevskogo street “Teren-6” was also used against the crowd, which means that just like in the case with the flashbang grenades – law enforcement officers violated the provisions of the legal acts. Besides that, according to the Rules, it is forbidden to make targeted shots at perpetrators when applying tear irritant substances, throwing and shooting grenades at the crowd as well as to use them again within the zone where such substances are still in action. According to the group of medical workers who were at Hrushevskogo street and provided assistance to the wounded, a strong smell of the irritants that were sprayed among the protesters was not being weathered which made it impossible for the medical workers to work without masks and respirators. Water cannons – is quite a widespread way to stop mass violations of public order. Their usage is considered to be more humane than that of the other impact munitions however only under the condition of observance of strict norms for their usage. According to the Rules, water cannons shall be used only to disperse the participants of mass disorders when the temperature is above 0 Celsius. This means that during the clashes on Hrushevskogo street the use of the water cannons was unlawful. As to the statements of the Ministry of Internal Affairs on the fact that the water cannons were used not against the people but in order to put out fire, we can say that there are numerous photos and videos proving that the water streams were aimed directly at the participants of the event with policemen themselves getting under it. Besides that, there are special fire trucks that are usually used in order to put out fires. According to the Rules, cartridges with rubber bullets of shock and opaque action “Volna-r” shall be shot with a special carbine on the distance of more than 40 meters from a person and only at the lower part of legs. Starting from the first day of protests traumatic weapons were used against the protesters. Among the injured are the people with injuries of hands, body, head and face caused by rubber bullets. There are cases when bullets hit eyes, mass media has the information that one of the injured lost an eye as a result of a rubber bullet shot. In addition to that, photo and video footage shows how law enforcement officers targeted people which makes it hard to qualify such traumas as accidental. Besides that, a lot of journalists suffered from rubber bullets which could be avoided as they have special orange vests saying “Press” on them. This means that journalists were also specifically targeted. According to article 19 of the Constitution of Ukraine, state and local authorities, their officials are obliged to act only on the grounds, within the limits and in a way prescribed by the Constitution and laws of Ukraine. This means that the on-duty law enforcement officers can be using only those methods and means that are anchored in the legal acts regulating their job. The Rules contain an exhaustive list of impact munitions that can be used by police and under what circumstances. Photo and video footage of the clashes on Hrushevskogo street shows that in response to “Molotov Cocktails” thrown at the police line, law enforcement officers threw the same incendiary mixtures at protesters. According to the Rules, the decision on the application of the impact munitions shall be taken by an official responsible for public order or the by the Head of a specific operation. Police officers acting individually shall take such decisions independently. According to the Law “On Police” law enforcement officer shall immediately and a written form report to his direct superior on the use of impact munitions as well as on any injuries or deaths caused by the use of impact munitions by the police officer in order to inform the prosecutor of it. This means that the responsibility for the unlawful use of impact munitions and injuries caused by it shall be borne by heads of the units and specific operations. Their identity can be and should be established by the prosecution authorities even when it’s impossible to identify the executor. The abuse of power with regard to the use of force, including impact munitions and weapons, entails responsibility set by the legislation depending on the injuries threatening life and health of the injured. Many factors led to the confrontations on the streets of Kyiv. However, the obligations of law enforcement officers include not only stopping but also a prevention of violations of the law. The Ministry of Internal Affairs of Ukraine has enough officers who had to do an operative work and take necessary preventive measures with the aim to avoid forced scenarios of events development. Police has to ensure public order and protect life and health of people under any conditions. This means that in a such intense situation law enforcement officers must not “punch back” and revenge for the colleagues who became victims but to stay as a guarantee of law and order. If the police violates the law and the Constitution – it destabilizes the situation, sets people against the law enforcement officers and leads to the escalation of the conflict. Analysis was made by command of Association of Ukrainian Human Rights Monitors on Law Enforcement (Association UMDPL).